In my previous post explained how you may create a custom coverpage for GFI FAXmaker based on your own company policies. 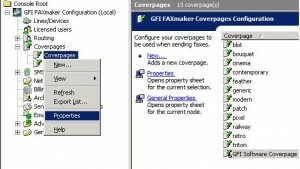 In this post I will show you how you can add the customized coverpage to GFI FAXmaker and then declare the selected coverpage as the default coverpage in GFI FAXmaker. In the previous post I created and then customized the HTM coverpage “GFI -Software-Coverpage.htm” to my own needs so we’ll continue from there. The coverpage “GFI-Software-Coverpage.htm” is ready for use. Open the GFI FAXmaker Configuration from the GFI FAXmaker program folder. From the left navigation menu open the node “Coverpages” >> “Coverpages” (1). Then select the option “New…” (2). In the “New coverpage” window enter an appropriate display name for the customized coverpage. In this example I will use the display name “GFI Software Coverpage” (3). Click on the button “Add from file…” and select the coverpage file “GFI-Software-Coverpage.htm” from the “Select coverpage file” Dialog. As soon as I add the new coverpage “GFI-Software-Coverpage.htm” to GFI FAXmaker, it will then be listed with the other coverpages. Furthermore, the coverpage properties window for the newly added coverpage will pop up. Now click on “OK” to confirm that no further options should be configured for the newly added coverpage (7). Select the option “Properties” from the context menu for the Coverpages node. From the coverpage options window select the coverpage “GFI-Software-Coverpage” as the default coverpage. Confirm this selection with a click on the button “OK”. In the last step I will need to restart both GFI FAXmaker services to apply the changes in GFI FAXmaker Configuration. 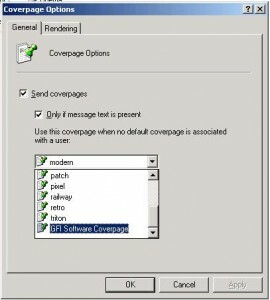 Now, GFI FAXmaker will add the new customized coverpage “GFI Software Coverpage” to all outbound faxes, if conditions apply as shown in the screenshot.